Its a Wonderful Movie - Your Guide to Family and Christmas Movies on TV: Troll's Holiday - an all new Christmas Cartoon! Troll's Holiday - an all new Christmas Cartoon! 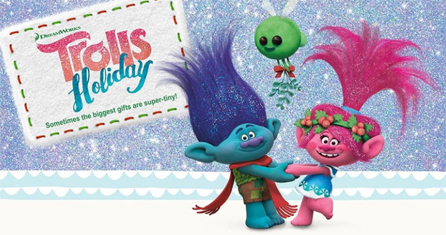 Storyline via NBC: Based on DreamWorks' hit musical-comedy film,"Trolls Holiday" is an animated special that continues the story of the Trolls and the Bergens. When Poppy, queen of the Trolls, realizes that the Bergens' calendar has no holidays to celebrate, she enlists Branch and the Snack Pack in a mission to enlighten her best friend Bridget and the rest of the Bergens about the importance of holidays. Can these two mismatched friends find something meaningful to celebrate, even if it's super tiny?